The Nickel Rim South (NRS) Mine is located near Sudbury, Ontario. Structured as an alliance style contract, Cementation provided engineering, design and construction services for the sinking of two concrete lined shafts, lateral development, and underground construction. Cementation engineering involvement in the NRS project began with active participation in the early scoping studies followed by the subsequent pre-feasibility and feasibility engineering. Cementation’s feasibility engineering efforts helped to define the project execution plans and to ultimately receive board approval for the project. The project involved the design and construction of two concrete lined shafts sunk concurrently; a 6.1 m diameter ventilation shaft sunk to a depth of 1680 m and a 7.6 m diameter main access shaft sunk to a depth of 1733.5 m. The decision to sink the two shafts simultaneously resulted when it was demonstrated in feasibility that the added capital cost would improve project economics by allowing the earliest possible start to lateral development required for deposit definition. The Construction also included the main shaft stations on three levels being developed concurrent with the shaft sinking. Cementation’s engineering group completed the detailed design engineering required for shaft construction and related infrastructure. Detailed design work included the headframes, shafts, hoist plants, surface support infrastructure, sinking equipment, material handling and dewatering systems, with the ventilation headframe receiving a national design award from the Canadian Institute of Steel Construction. The two shafts were sunk without a lost time injury. 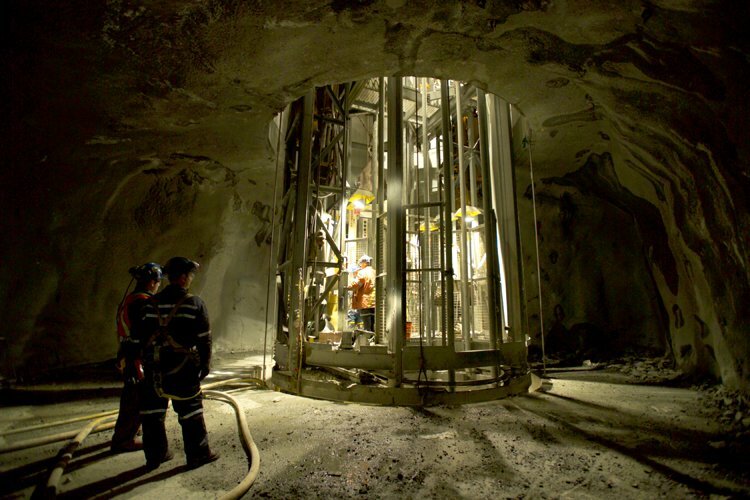 Upon completion of the shafts, Cementation was awarded the lateral development program to establish three captive levels and associated sub-levels for the purpose of deposit definition drilling and early ore development. The development method included in-cycle shotcrete, water scaling and drill jumbos to drill both the face and the ground support. The scope also included the operation and maintenance of the ventilation and main shafts for the duration of the development program. After the lateral development scope was completed, additional work was carried out to support the construction of the site infrastructure. The success of the Nickel Rim South project is an example of Cementation’s partnering approach, design-build capabilities, and ‘best for project’ philosophy.